Sophie was the fifth child and fourth daughter of William Skinner and Mary (nee Williams). It is possible that Sophie’s father was the twenty-four year old William Skinner convicted for taking part in robberies and sentenced to 14 years transportation in York in January 1840. But this means he was born in 1816 not 1818 as was later recorded. This man arrived in Hobart in June 1840 on the Mandarin and spent a year and a half on probation and received a ticket of leave in December 1848. He a bit rebellious but well behaved and a good worker. He worked in many parts of Tasmania before finally being certified as free in Longford in January 1854. He was born in Sheffield England. Two other men of the same name arrived as free immigrants – one on the Cumberland in January 1825 and another on the Calypso from Geelong in December 1854. One of these two might also be Sophie’s father. -their first son, Stephen was registered by Luke Provis, a friend of Mary Richardson’s daughter Susan. - their second son by Mr Richardson. Both were born at Sorell. - Mary Richardson and her son William witnessed Mary Williams’ marriage. Perhaps Jane named her first born after her employer and friend. Henry Williams was 27 when he married but Jane Brown was 10 _12 years older. Jane was transported for life in 1818 when she was 20 years old. The Convict Record shows neither personal details nor subsequent convictions. She was a house servant of ‘excellent character’. Henry was probably also a convict – there were about six men of that name arriving at about the right time. It is possible that Jane was assigned to Mary’s family and later worked for her after the marriage to Charles Richardson. Henry and Jane appeared to move with the Richardsons up to about 1855. 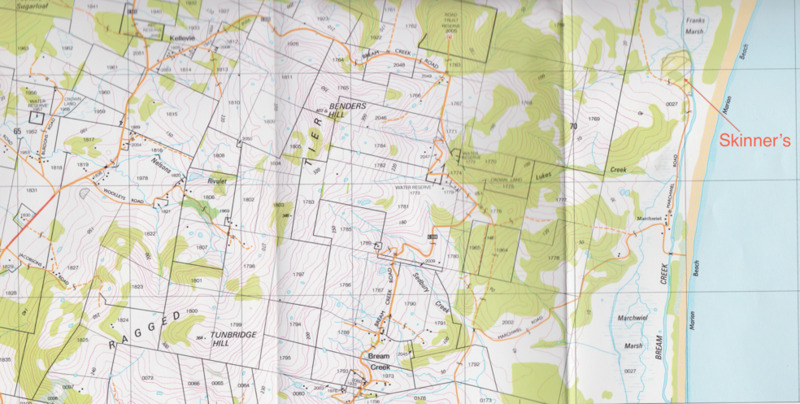 View Tasman Penninsular in a larger map" rel="self">Skinner’s Paddock and is readily seen on satellite photographs. It is on the Marchweil Road, 1 km north of the main house and stretches from the road to the banks of Bream Creek where that stream leaves the hills and begins to cross the flats.. Across the Creek is the long expanse of Marion Bay beach with Maria Island 15 km to the northeast. In 1871 the Roll shows that that property was owned by C. Kingston. After 1873 the entries for Skinner disappear. After 1868 Henry and Jane Williams are recorded as living in a cottage on a 100 acre farm at Ragged Tier just to the west of Bream Creek. By 1873 it seems he had bought that property. William Skinner was a farm tenant/worker for the Dunbabins from the late 1850s. William and Mary had five daughters and a son whilst living at Bream Creek. Four of the girls followed their mother’s example and married as teenagers. The family lived at Bream Creek until 1873 when they moved to Hobart by 1873 when their last child, Joseph, was born. It seems they originally lived in West Hobart before moving to Battery Point. (see next chapter) William Skinner died on 16 December 1891 at 24 Kelly St.
William Henry, (named after Sophie’s older brother). Born 26 Jan. 1884 and died 14 Aug. 1932) married Margaret Knight in 1905. Their children were Vera b 1916, Ron and Nell. Ethyl Rubylin May (born 25 Jul. 1889, married George Beck in Launceston in August 1913), died Hobart 26 Feb 1952. Dorothy Lillian ‘Doll’, (born 3 Jul. 1895 d 24 Oct 1963. married Bollard Kempton Spence (born ca 1878 died 4 Feb. 1946) as St Georges Barry Point 7 Jul 1915. Harold James (Joe) (born 21 December 1896 Liverpool St. and died 13 Aug. 1953 Percy St Bellerive) . Married Helen May Rennie 7 Dec 1921 also at St Georges. She died June 1969. Pearl Irene (born 6 March 1899 married Ernest Haas (Hayes), born 1898) on 5 January 1922 also at St Georges. Gilbert Thomas (born28 August 1904, died 6 August 1917). 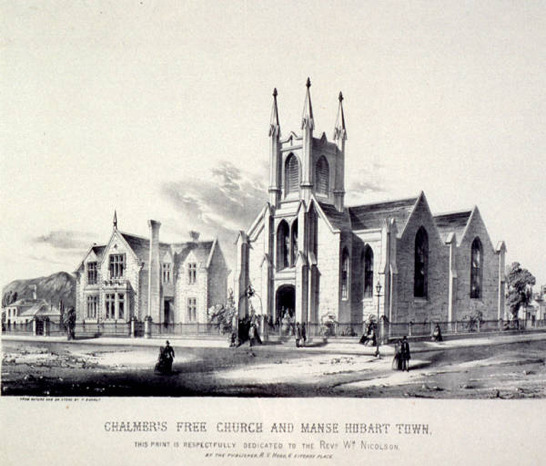 Between 1883 and 1900 Patrick and Sophie lived at various addresses in central Hobart. (See P markers in map H2)William was born in 1884 when they lived in Melville St. When Percy was born three years later they were in Liverpool St. and still there when Ethyl arrived in July 1889. (Ethyl’s birth in 1889 was registered by a friend ‘Maria Lester of Moodie’s Row’). Around 1890 he gave up work as a miller and began work as a self-employed carrier. Hilda was born in 1891 in Goulburn St. and Pat was described on her birth certificate as a luggage van proprietor. When she died of dysentery eleven months later the death certificate described Pat as a carter and gave their address as New Street. Claude was born seventeen months later and by then they had moved to 30 Barrack St. and Pat was a ‘parcel delivery proprietor’. They stayed there until 1896 when they moved to Liverpool St.; in 1896 and 1897 at 287 then a few months at 201 then at 209 and in 1899 at 9 Liverpool St. and then back to 287 in 1901. However some of these may have been commercial addresses. In 1901 Pat rented a house and stables owned by David Sergeant at 31 Melville St., three doors from the corner of Argyle St. towards Elizabeth St. Pat had a contract with Black Brewery (on site of present Black Buffalo Hotel) and his son Percy worked with him. Percy’s youngest sibling, Gilbert, was born in Wells St Sandy Bay in August 1904. Soon after his parents moved there. The carrier business operated from Sandy Bay for some years. The eldest son, William Henry, was married on 31 March 1905 to Margaret, daughter of William Knight, He was 21 and she 34. (She was born in Bothwell to William and Margaret (nee Burke) ??). The ceremony was performed by Rev. Isaac Palfreyman at his house on the corner of Andrew and Arthur St. North Hobart. William and Margaret apparently lived with Pat and Sophie for some time after their marriage. Percy was married in St. David’s Cathedral on 7 August 1907 (see later). On Percy's wedding certificate Pat’s occupation was stated to be 'luggage van proprietor’, After his marriage Percy began his own business as a carter and employed his brother Bill. In 1914 he bought a touring hire car to replace the carts. 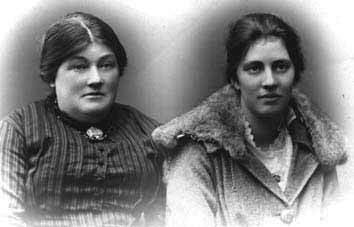 Ethyl married George Beck in 1913 and her sister “Dol’ married Bolland Spence in 1915. She later they lived at Bellerive and she operated a kiosk near 12th Tee on the Royal Hobart Golf Club at Rosny for over 30 years. Their children were Jack, Dulcie, Peter, Henry Charles and Kathleen. Pat and Sophie moved to 63 Colville St., at the corner of St. George's Terrace and Colville St. Battery Point, around the time of Ethyl’s marriage in 1913. (Sophie’s sister Nell still lived nearby in Kelly St.) Pat operated his carting business from this house and it was said that his horse would bring him home unaided from the nearby Shipwright’s Arms. It was believed that Patrick received money 'from overseas which stopped when World War I started'. (From his grandfather?) Claude was unmarried enlisted in the AIF a fortnight after the War began but Percy’s wife was pregnant so he waited until the new son was safely delivered. Bill was older and had five children but decided to go with Percy to join their younger brother in August 1915. In 1916 Claude and Percy were killed in France during World War I (see later). Joe was then sent back to Australia. The youngest child, Gilbert, died aged twelve in 1917. The loss of three sons in quick succession and the war injury to William was a terrible blow. In 1920 Pat and Sophie lived at 15 Brisbane St. but in March 1921 he bought a house in Queens Street Sandy Bay. Pat’s youngest living son Harold, known as Joe, married Helen May Rennie, the daughter of neighbours in Queen Street, Arthur Tasman Rennie and Harriett Alecia (nee Davis), at St. George’s Battery Point on 7 Dec. 1921, A month later the youngest Harrison girl, Pearl, married Ernest Haas they lived at Cornwall in the Fingal valley where he worked as a coal miner. Five months later Sophie fell ill and was taken to Hospital where she died on 15 May 1922 aged 55. She was buried at the now abandoned Queenborough Cemetery two days later. Fourteen months after Sophie’s death Patrick married a widow, Mary Elizabeth Belcher, he was then 61 and his bride 49. She was born in Hamilton, Tasmania to Henry Richards and his wife Mary Ann Collins. Her first marriage to William Belcher resulted in eleven children and so between them Pat now had 20 children, but not all of them were still alive. .Mary moved into the house at 37 Queen St. Pat died in the Royal Hobart Hospital on 20 October 1943 and was buried at Cornelian Bay Cemetery the next day. In his will he left £50 to his stepdaughter Elizabeth Louisa Kerslake and his household and personal goods to his widow Mary. The remainder of his estate was to be invested by the Public Trustee and from that fund 12/6 (per week/) went to Mary the residue was divided equally between his three surviving children Harold, Dorothy and Pearl. Joe and Helen later lived at Bellerive and had three children Alan, Geoffrey, and Thea. Helen died 3 June 1969 in Geoffrey’s home in West Moonah.